Ex-offenders rights advocate Willie J.R. Fleming commends CHA Board members during a recent meeting to discuss creating housijg for women ex-offenders. Photo by Mary C. Piemonte. Women ex-offenders who formally lived in Chicago public housing will get a second chance to get supportive housing under a plan announced this week by the Chicago Housing Authority Board of Commissioners. At their Aug. 16 public meeting at the Savoy Square Community Center, 4448 S. State St., the CHA Board authorized interim Chief Executive Officer Carlos Ponce to contract with the Viceroy Apartments on the Near West Side to set aside 17 units of subsidized housing for formerly incarcerated women who once lived in public housing. The Viceroy Apartments is a six-story brick hotel that was constructed in the 1920s and is located at 1519 W. Warren Blvd. Heartland Housing is redeveloping the structure to include historic preservation of the façade and a total rehab of the interior and its 89 studio apartments, according to an Aug. 10 letter from CHA staff to the board that was e-mailed to Residents’ Journal. The letter indicates that 72 units in the building will for homeless women or those at risk of being homeless. The CHA waiting list will be the primary source of referrals for these 72 units. The remaining 17 units will be master-leased to St. Leonard’s Ministries to provide permanent supportive housing to women ex-offenders. The City of Chicago is donating the property, while Low Income Housing Tax Credits, Tax Incremental Financing (TIF) funds and other sources will be used to complete the rehab. Rent will be set at approximately $685 per month. Reynolds added that CHA is also working on providing supportive housing to male ex-offenders in the future. “I can tell you that we’re going to seek to expand this,” he said. 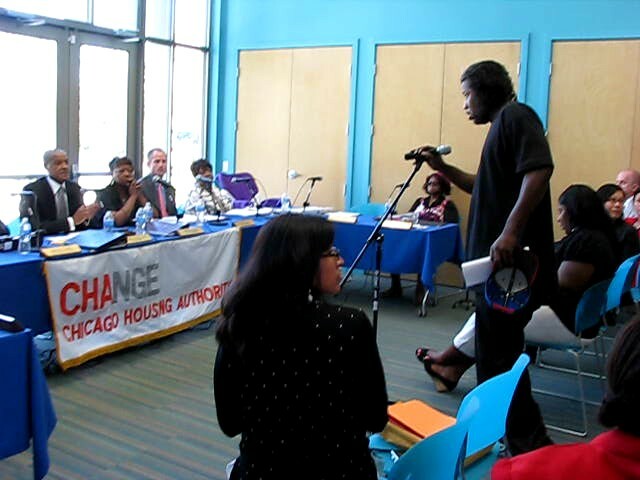 Willie J.R. Fleming, a member of the Chicago Anti-Eviction Campaign and a co-founder of the Campaign to Restore National Housing Rights, praised Reynolds and other CHA board members on providing subsidized housing for the women ex-offenders during the board meeting. Fleming added that they also believe that the new initiative is going to stop some of the violence in the city’s low-income communities. “These mothers have a chance to get their children back under the roof with them and raise them in the correct manner,” he said. Fleming also commended Ald. Walter Burnett (27) for his part in the new housing initiative. “As an ex-felon, he knows about ex-offenders’ rights,” he said. According to current federal law for nationwide public housing occupancy, ex-felons are not allowed to rent any public housing units. But the CHA is looking for ways to rectify that situation, according to Fleming. This entry was posted	on Thursday, August 18th, 2011 at 12:10 am. You can follow any responses to this entry through the RSS 2.0 feed. You can leave a response, or trackback from your own site.